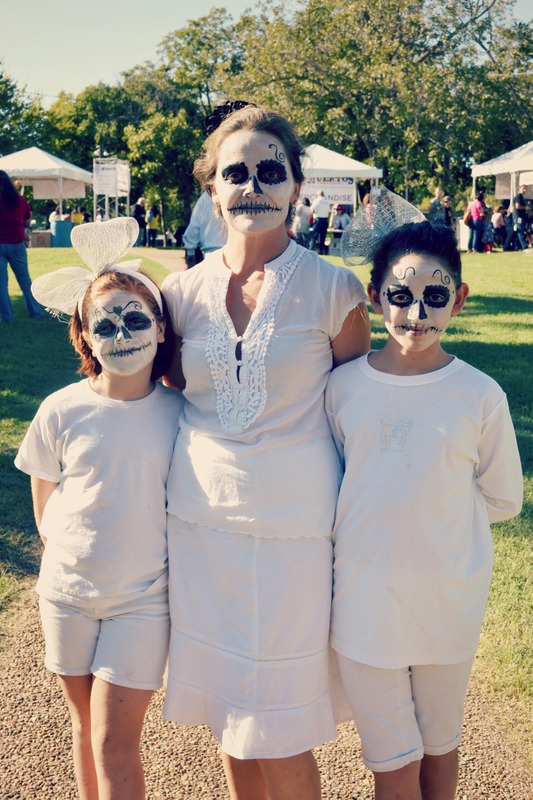 On the sunny Saturday of Oct. 19, Austinites gathered in Fiesta Gardens beside Town Lake to dance, play, create and celebrate with the dead at the first annual Easter Seals Texas Dia de Los Muertos Festival. 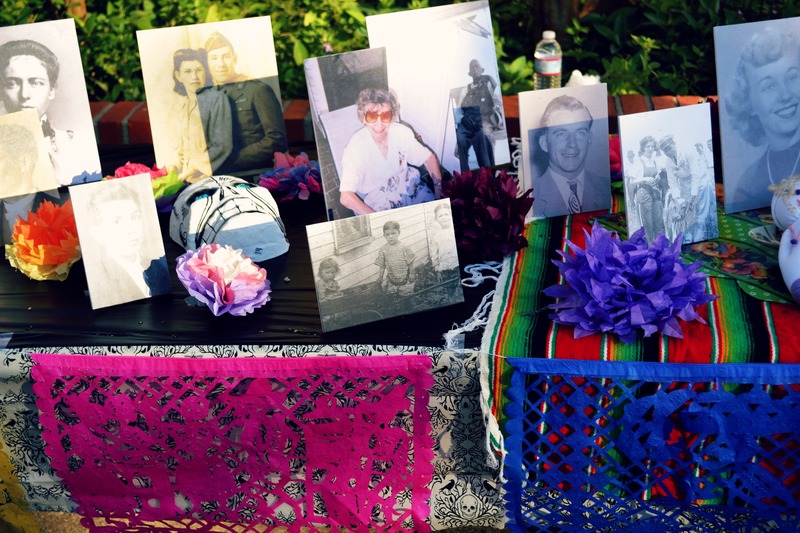 With skulls painted decoratively on participants' faces and colorful paper flowers blooming from hairpieces, families honored the dead by enjoying lively music and sweet treats in tradition of the Mexican holiday. Dia de los Muertos is a Christian holiday, originally inspired by an Aztec festival honoring ancestors and the goddess of the dead. For two days every year, November 1 and 2, communities around the world join in with the spooky and playful spirit of this pre-colonial tradition to remember lost loved ones and celebrate the living. The harmonious duality of cultures is ever-present in Dia de Los Muertos traditions around the world, but a mezcla of cultures especially exists in the city of Austin, Texas. In Austin, this holiday and Hispanic culture have had expanding cultural significance to accompany the recent influx in the city’s Hispanic population (one of the city’s “top ten” notable demographic trends according to the Planning and Development Review Department of the City of Austin). At the Dia de Los Muertos festival, children jubilantly hula-hooped, young couples found romance in the sentimental spirit of the holiday and the older crowd stayed young at heart through carefree dancing. This variety in the crowd at Fiesta Gardens vibrantly reflected the broader trend of young, family-centered Hispanic populations that have chosen to take their roots with them to Austin, Texas. With about 35% of Austin identifying as Hispanic today, more events celebrating Hispanic heritage, food, history and holidays have popped up around town. These events typically invite all members of the community to participate, which has helped to color Austin as an increasingly diverse mosaic of cultures and peoples. At the Easter Seals' event, skulls of all sorts sat among portraits of the community’s loved ones, greeting guests from atop three altars at the festival entrance. For the celebration of Dia de Los Muertos, skulls, ritually kept as trophies by the Aztecs, have transcended time as symbols of death and rebirth. At the modern festival here in Austin, colorful skulls made of sugar, paper, paint and clay served to both honor the dead and raise awareness for the Easter Seals’ mission — helping those in the community with disabilities to experience life as something worth celebrating. In the spirit of the Mexican tradition, altars had been constructed at the festival to present offerings (ofrendas) of toys, flowers, and sweets to the dead. People also had the opportunity to write the names of those they wished to honor on paper skulls and place them on the altar, along with ofrendas of their own. Music and costumes are also very important aspects of Dia de Los Muertos. At the Dia de Los Muertos Festival, the Dead Music Capital Band, decked out in creepy costumes, played some spooky tunes from a variety of eras. Those who came in costumes were able to join in the parade, dancing among others with Dia-themed dress and a couple of charming, giant, skeleton puppets. Celebrating Dia de Los Muertos also signifies a celebration of traditional Mexican delicacies. Eats at the festival included botanitas (warm, corn tortilla-like pockets filled with seasoned meat and veggies), Dia-themed candies, espiropapas (spiral-cut potatoes skewered and seasoned), mangonadas (sweet, frozen drinks), huesos (“bones” made of flakey, sugary pastry), and pan de muerto. Pan de muerto, as the bakery vendor explained, is a traditional treat made special for the celebration of Dia de Los Muertos. The sweet bread, topped either with savory sesame seeds or covered in glistening cinnamon sugar, is a common treat used as an ofrenda to the dead: something tasty to put on the altar for the dead’s delight. Local bakeries are not the only places around town offering festive treats to Austinites for this day of celebration. 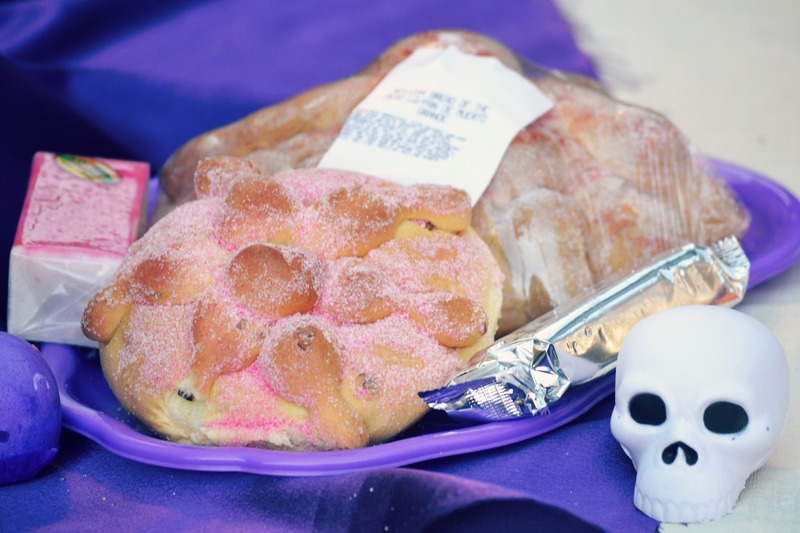 At HEB, Fiesta, or most local groceries here in town, you will find pan de muerto, huesos, and Mexican candies for sale. Although many get Dia de Los Muertos and Halloween confused (perhaps because they have become somewhat commercially parallel), Dia de los Muertos is something "quite different from Halloween," Mexican artisan vendor and architectural artist Mario Morales Jr. tells ORANGE. He says that Dia de Los Muertos celebrates people reflecting on history and culture and a deep appreciation for the joys of living life, unlike Halloween's focus on being scary. After its impressive introduction, accompanied by a lively music scene, rich cultural significance, artistic opportunity, wonderful cause and playful atmosphere, the Easter Seals Texas festival earned a spot in this city’s ever-expanding repertoire of annual festivities. 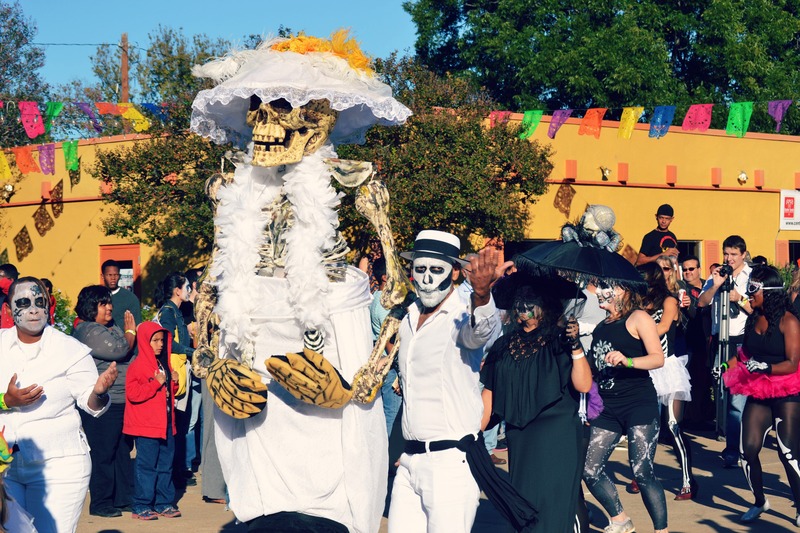 Although this year it was relatively small, and mostly a scene for children, this Dia de Los Muertos celebration is likely to grow in these upcoming years and become a seasonal spectacle not to be missed! To stay updated about news of next year's activities, go to www.austindiadelosmuertos.com. Other events to celebrate the holiday around town include the Dia de los Muertos costume, car and bike parade hosted by the Emma S. Barrientos Mexican American Cultural Center today, Nov. 2. For more information about Dia de Los Muertos events around Austin, go to austindaysofthedead.com.